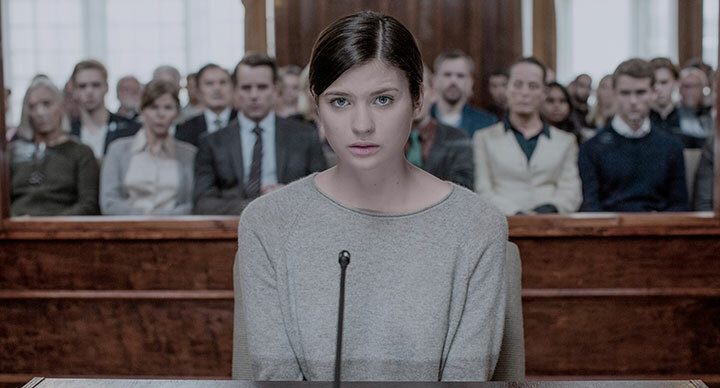 Based on the bestselling novel, Störst av Allt (Quicksand) sees a teenager put on trial for murder in the wake of a high-school shooting. DQ hears from the creative team behind Netflix’s first original Swedish drama. The opening moments of Swedish drama Störst av Allt (Quicksand) are nothing less than chilling. From a black screen, the sound of half-a-dozen shots ring out, before the camera hovers over the bloodied bodies of the victims of a school shooting. When it comes to rest, with screams still ringing in the background, it is on Maja Norberg, sitting frozen in a chair, blood staining her jumper, a discarded rifle at her feet. Apparently the only survivor of the horror, Maja is swiftly taken away by police, cleaned up and charged with murder. But what really happened in that room – and what was the role played by her boyfriend, Sebastian Fagerman? Over six episodes, the drama jumps back and forth between Maja’s police interrogation in the present and a past exploration of her relationship with Sebastian – how he swept her off her feet before she was seemingly corrupted by his dysfunctional lifestyle and family – until it is revealed whether she is in fact guilty of the shocking crime. Notably, Quicksand is Netflix’s first Swedish original series, with producer FLX bagging the rights to Malin Persson Giolito’s bestselling novel amid fierce competition. Ahlgren opened a writers room with Veronica Zacco and Alex Haridi to work on the scripts, based on the “clear idea” she had for the series. Giolito, a lawyer, was also involved, offering greater insight into the ideas and themes of the book and helping to read drafts. Complications on set included finding a yacht that appears in episode one and filming spectacular party scenes that take place in Sebastian’s luxurious family home. Though the ending of the book stands strong in the series, which is exec produced by Pontus Edgren and Martina Håkansson, Ahlgren says it was important to keep viewers guessing over Maja’s guilt right up to the conclusion. How to achieve that was a discussion that kept the producers and writers engaged throughout the drama’s development and even during the editing process. Netflix also brought in an additional exec producer who hadn’t read the book or seen any of the scripts to cast a fresh eye over the drama. While on the surface Störst av Allt (Quicksand) appears to be the cut-and-dried story of whether a high-school teenager is guilty of carrying out a killing spree, the series is far more complicated than that. Sørensen worked closely with head writer Camilla Ahlgren to ensure that by the time he was on set, “her intentions for the story and every single scene are in my DNA.” She was also just a phone call away should he need her advice, with the script still open for rewrites deep into filming. The director says the show presented him with a unique challenge due to the fact the novel is written like a long monologue purely from the perspective of Maja, the accused at the heart of the story. Early on, he ruled out using voiceovers to convey her inner thoughts, instead using close-ups to reveal the facial expressions that betray Maja’s true emotions. 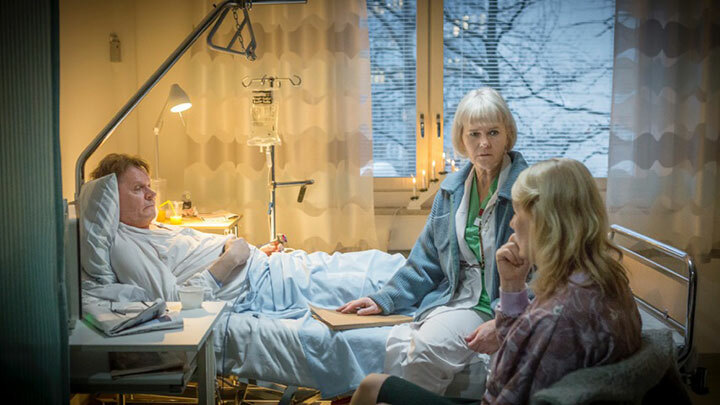 A doctor and a teacher approaching retirement decide to secure their futures by robbing a bank in Swedish comedy drama Enkelstöten. Executive producer Pontus Edgren tells DQ about the decision to swap men for women in the lead roles. When it comes to adaptations, there are a few techniques you might expect to see when a novel is being prepared for the screen. The story will be tightened or expanded to suit the number of episodes and, consequently, new characters might be added, or existing ones omitted altogether. In the case of forthcoming Swedish series Enkelstöten (A Simple Heist), however, two women take the lead in roles that were originally written as men. Based on a book by Tomas Arvidsson, it follows a teacher and a doctor who decide to rob a bank. It was first translated to the screen in a 1980 miniseries, which faithfully adapted the story. But in a new six-part series airing this autumn on TV4, those lead roles have been switched and aged up, as two women in their 60s decide to carry out the heist. The plot centres on Jenny Bengtsson and Cecilia Svensson, who enjoy a middle-class life in the Swedish town of Kalmar. But with retirement approaching and their bank accounts somewhat lacking, they decide to rob a bank in Stockholm. The series follows the duo as they weigh up the pros and cons of the bank job, eventually deciding to go through with it, and goes on to detail the heist itself and the aftermath. But as changing the lead characters might suggest, A Simple Heist isn’t exactly a traditional adaptation. “We’ve taken basic core elements of the story but to a great extent we have created a new story,” executive producer Pontus Edgren says. “It’s still about a teacher and a doctor who feel that life has been unfair to them. One has gone through a divorce and doesn’t get much out of it economically, and the other has invested her money very badly and her husband doesn’t know that the money with which they were supposed to buy a house in France has virtually gone. They also have big demands on them, from parents and students to patients and their bosses, so they’re squeezed from many different positions. 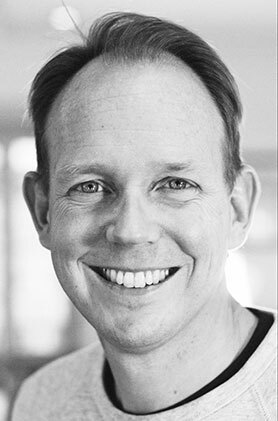 It’s a story that is personal to Edgren, MD and co-founder of producer FLX, as Arvidsson is a family friend. The exec is also a native of the town in south-east Sweden where the story plays out. From the outset three years ago, when FLX picked up rights for the series, women were at its heart. TV4 immediately liked the premise, and placed a commission a year later. 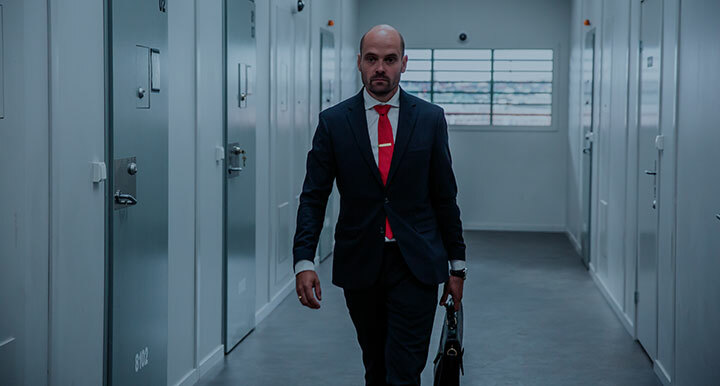 The series had its world premiere at Série Series earlier in 2017. However, the actors who came to fill the leading roles, Lotta Tele (Jenny) and Sissela Kyle (Cecilia), weren’t originally in line for the show. “In the very beginning, when we first started looking at having female leads, we looked at them being around 40, but we couldn’t find exactly the right dynamic between the two so we moved up the age and changed the premise a bit to explain why they decided to commit this crime. Then we found them quite quickly. “We knew Sissela and Lotta very well. Sissela, particularly, has done a lot of comedy and has proven herself to be a great comedic actor. Lotta has more recently gone into that genre and is perfect for this. They’re quite different characters. The limited budgets available in Sweden mean productions are largely filmed in and around Stockholm. But for A Simple Heist, the production team was keen to film as much as possible on location in Kalmar, a five-hour drive from the capital. As Nordic noir continues to evolve, A Simple Heist stands out as another example of how the region is pushing beyond the gritty, grisly crime dramas that viewers around the world have come to know and love. FremantleMedia International is selling the six-parter globally.